Bolsey Camera Corporation, New York, U.s.a.
One of the best movie camera ever produced in the world. It was the smallest machine in the world, smaller than a pack of cigarettes. The measures are the following: 30x65x79 mm and it weights 350 grams. A silvery metal housing contains a special cartridge for 7.5 meters long 8mm film, produced by Gevaert in Belgium. This clockworks wonder could record for more than two minutes before the film had to be changed. This movie camera is equipped with a lens Bolsey Elgeet Navitar f/1,8 10mm. It was produced in United States in 1958. 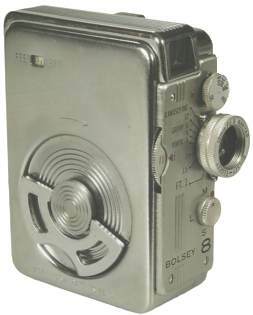 In 1955 Jacques Bogopolsky, alias Boolsky, alias Bolsey, produced a movie camera in Germany, named Bolsey 8 Finetta, in addition to a Bolsey 8 Lady for the English market. These machines are rare, especially the movie cameras produced in Germany.